General Admission (GA) refers to seating or standing areas that are not assigned or reserved, and are occupied on a first-come, first-served basis. When purchasing tickets for a General Admission (GA) event, you may be quoted section, row, and seat numbers, however these are for inventory purposes only and do not reflect any actual seating location. Please ensure you carefully read the Event Information and Ticket Information screens when purchasing tickets: Any information on whether your tickets are General Admission (GA) will be posted on one or both of these screens. Seating arrangements vary for each event, and there may or may not be seats of any kind available. Ticketmaster cannot guarantee seating for any event that is sold as General Admission (GA). Standing Room Only (SRO), PIT and Lawn are types of General Admission (GA) in which there are no seats at all. 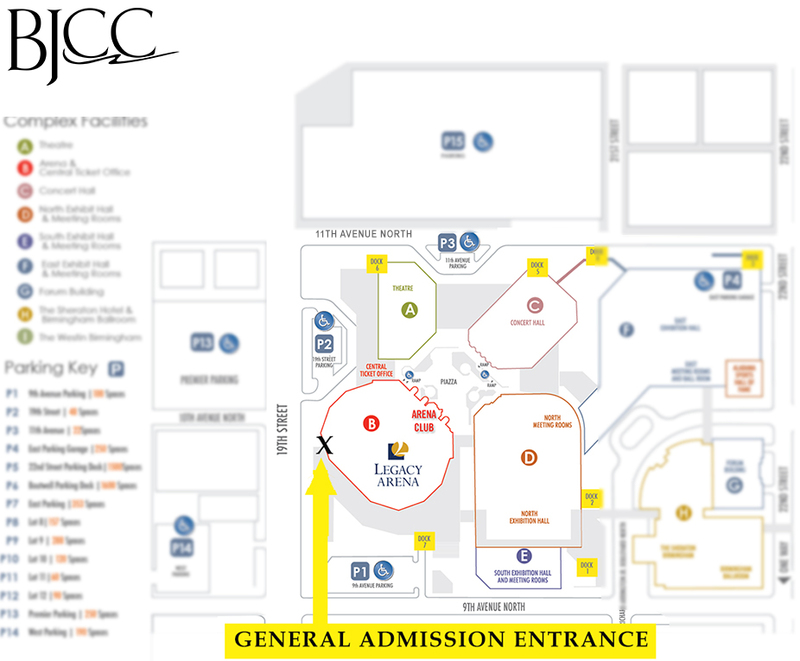 For guest with a GA ticket, the entrance is located at the ramp at the corner of 19th Street North And 9th Avenue North (see map below). Ticketholders will not be allowed entry through other doors at the venue. After ticket is presented at entry, guest will be given a wristband that must be worn during the duration of the event; this will allow access to the floor. Security will begin pre-screening three (3) hours before event time stated on ticket, however times are subject to change without notice. Arriving before pre-screening is not necessary but if you choose to begin forming a line at the magnetometer (metal detector), please keep in mind there are no restroom facilities available. Am I allowed to Camp Overnight on the property? No camping or overnight stay is permitted at any time.